I am in a season of life where I am looking to simplify. I want to be intentional with my days and spend time on what is important. I don’t want to look back and wonder if I valued my stuff more than my people. I am simplifying my business, my home, my family…and it is so freeing. I find I can enjoy life more, I am not distracted or easily stressed out. I wanted to share some things that you can do today in only a few minutes to simplify your own life. Read your favorite inspirational book. If you need some new book recommendations, I have plenty. Hand write a thank you note to someone and put it in the mailbox. Turn on background music, lay down and close your eyes. Open your email and unsubscribe from as many lists as you can. Bring a trash bag to your car and clean it out. Toss or collect in a donate box any shoes you haven’t worn in a year. Bring a box into your bathroom and fill it with anything that has expired or that you don’t use or that will be expired by the time you use it. Go through your medicine cabinet and toss anything that has expired or you no longer need. Be sure to dispose of it correctly. Read this: Learn to Consider Gratitude a Discipline. Clear as many counter tops as you can while still taking the time to put things where they belong. Have a donation box close by in case that is where they belong. Decide on an unplug schedule- meaning certain hours of the day where you turn off your computer and phone. Write it down and stick to it. Look over your planner, calendar and command center and make sure they all line up with each other. Decide if you are overscheduling and make adjustments as needed. Celebrate your simplicity! This is a journey and will never be a perfect arrival. Focus on the one thing you can do each day that will make the biggest impact. If you are constantly busy and stressed out, focus on your mind and take a few minutes to just be in the present. Look at your schedule and see what you can let go of. If your home is your source of stress, keep a donation box at your door and fill it up each day. If your closets are overflowing, research capsule wardrobes. Little by little…you’ll get there. These are such good tips! I love getting hand written notes and I don’t nearly send them enough to friends and family so that is something I need to work on! One way I simplified my life was cleaning out the junk drawer the other. I felt so good after it! These are all awesome. I just did a big purge in my house, simplified many things. It felt really good. I have so much stuff in a “donate pile” that I keep leaving there. I need to just drop it off and stop leaving it in a corner of our house. That would help! I wrote a similar post like this on my blog recently as well! I love that you focus on organizing and decluttering your spaces. This list is awesome! The donate box is a lifesaver! I have filled mine up in the course of two months, which may not sound that great, but I thought I was decluttered before I had the box! I have also been practicing to leave my phone out of arms reach so that I step away from it more. It has really helped me relax while doing daily tasks. We just donated 2 whole cars full of stuff! I’ve been doing my second round of “spring cleaning” haha and it feels soo good to know I have less clutter in the home. Great tips! Great tips! Unsubscribing from mailing lists is a good idea. Simplification is my goal right now also. Too much mental and physical clutter distracting from whats important. Clearing countertops is such a great tip!! It refreshes a space so easily! I like to take 10-15 minutes to sort the mail, shred it, file it, or place in a pile for later action (paying a bill, reading a magazine, etc). Another favorite is to take the time to clean out my email folders and unsubscribe to lists I am no longer interested in. Both things make me feel lighter and accomplished after doing them. Love this! 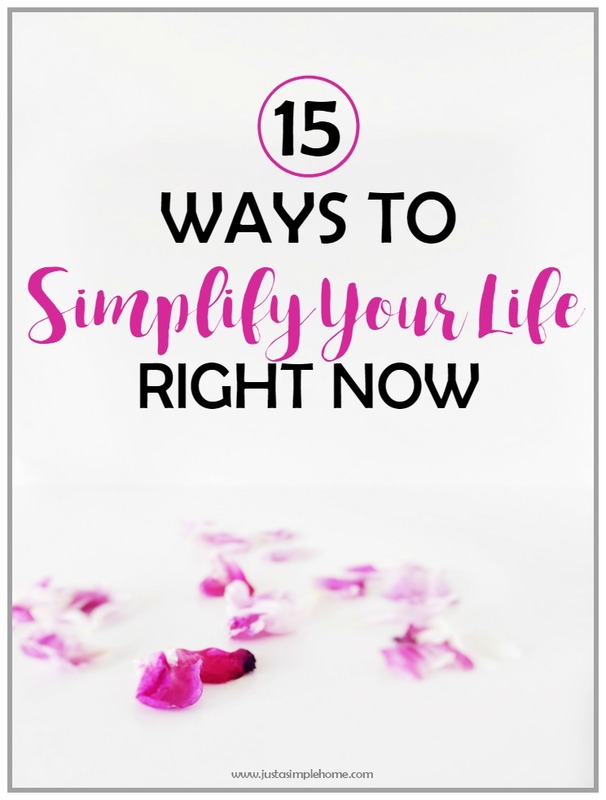 I think we all need to go and simplify our lives once and a while and we can feel so overwhelmed we don’t even know where to start. Love love love this! The first thing I will do is unsubscribe from bunch of useless newsletters! This is awesome. I really like number 7. In fact that is going on my “to do list.” These are very inspiring and motivational thoughts. I have written a letter to 8 people that influenced me greatly and I hand delivered it to them. Such a simple solution – I am definitely going to try it! I am overwhelmed with all my to-dos, but if I set aside this time, I know I will feel a bit better. There’s no reason to dwell or spend forever doing it. Love this – thank you! I LOVE this list! I think I might add each of these things to my to-do list (one a day!) from now until our baby boy arrives! That will help with the crazy nesting I have going on right now! This is a great list! I just know I’ll be putting off the boring tidying tasks in favour of reading and writing hand-written notes though, haha. Awesome tips! Can I tell you, I unsubscribed from a TON of emails last month and MAN did it feel GOOD! These are great tips! I am trying to find times during the day that I can “unplug” and spend more quality time with God, myself and my family. Oh my gosh, I totally need to do number 4 and number 7. And using a timer is such a great tip, I love doing that. Otherwise I can fall down the rabbit hole of whatever task I’m workign on and spend way too long. Great tips. It is actually quite funny how hitting unsubscribe can give you so much relief. I try and do this at least once every few months. Great tips! I think this is so helpful! I think I would feel way more relaxed if I stopped and read a book for just 10 minutes! I’m going to try this. I love doing #4. In fact, I often pop in there and unsubscribe from all the junk email lists that I get added to. I also like to clean out my bathroom of all the products I buy and try but never incorporate into my routine. I like to do this when we have a yard sale and I set them all out marked free.